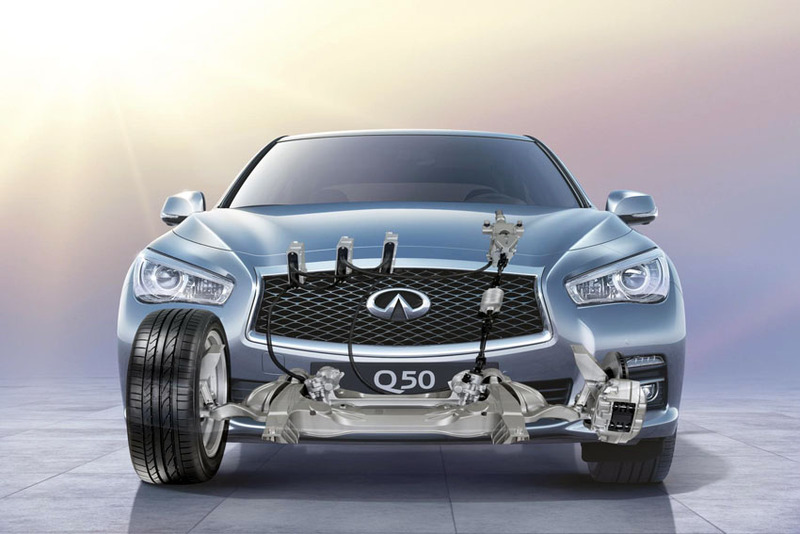 Drivers of Infiniti's all-new mid-size premium car will be the first to benefit from electronic steer-by-wire technology, inspired by latest jet aircraft technology, when the Q50 hits the roads later in 2013. Q50 range, will for the first time allow drivers behind the wheel to choose how that wheel feels in their hands. The steer-by-wire technology is a key ingredient in making the Q50 one of the most dynamic and exciting sports saloons on the market - extensively tested by Sebastian Vettel. Infiniti Red Bull Racing's triple Formula One World Drivers' Champion - who is also Infiniti's Director of Performance - helped fine-tune the Q50's performance and handling at Infiniti's Tochigi test track in Japan. Light and smooth for maneuvering, firmer and more agile for sporty driving and challenging roads, Direct Adaptive Steering makes all options available via simple touch-screen controls. Uniquely in the class, both steering weight and response can be tailored, with all settings stored for each driver in the Q50's sophisticated memory. Like a jetliner, Direct Adaptive Steering benefits from several back-up systems - including a conventional mechanical steering linkage. Direct Adaptive Steering works by electronically transferring the driver's input to the front wheels where a high-response actuator drives the steering rack. By eliminating the mechanical losses that can dull the responses in conventional systems, steering response is faster and vibration at the steering wheel is eliminated. All this is achieved with a level of feedback from the road that is central to every Infiniti's performance feel. Steering is adjusted on a touch screen as part of the Infiniti Drive Mode Selector. Depending on the model, there are up to four pre-set modes plus a personal setting that allows the driver to mix and match effort and response to suit individual driving style and type of road. As a result and in defiance of conventional car steering compromises, the Infiniti Q50 with Direct Adaptive Steering is as stable and stress-free to steer on a motorway as it is reassuring and rewarding to handle on a mountain pass - or as light and easy to maneuver in a crowded car park. A further benefit of Direct Adaptive Steering is that it comes with Infiniti's latest driving technology, Active Lane Control. This is unique in using the steering system to keep the car between motorway lane markings, 'magnetising' the car to within its lane and reducing the need for continuous steering input owing to crosswinds or minor camber changes in the road surface. Direct Adaptive Steering comes with triple-mode back-up (three separate electronic control units), 400,000 km of real-world test distance behind it and the back-up of the mechanical steering linkage. In normal use a clutch disengages this mechanical link so it can never corrupt the steering response. Direct Adaptive Steering and Active Lane Control will be standard on the Infiniti Q50 3.5 Hybrid and optional on the 3.7-litre V6. Infiniti Q50 models without Direct Adaptive Steering are equipped with electro-hydraulic steering that offers drivers the ability to customize steering weight.